Whether you plan to take a summer holiday or a winter break, you'll find something a bit special at Colts Close Cottage. 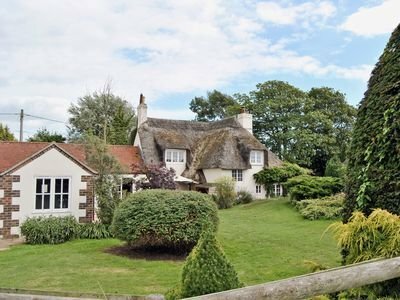 For starters, Colts Close Cottage is a thatched cottage - the chances are when you think of a traditional cottage, something like Colts Close Cottage pops into your mind. For those looking to get away for the summer, Colts Close Cottage offers you a private outdoor swimming pool - what better way of starting the day than by having a little swim. Or for those glorious hot days, you can just spend the days sipping a Pimms by the pool while the nippers splash around to their hearts content. Or maybe a winter break is on the cards for you, in this case you'll appreciate the wood burning stove and Aga which Colts Close Cottage has; you can get out and explore the area by day, and a cosy night in by the wood burning stove. Colts Close Cottage sleeps 8 people in 4 bedrooms, all four bedrooms are doubles. Although one of the bedrooms is in an annexe by the swimming pool, and can only be used in the summer months. As well as the wood burning stove and the Aga, you also have gas central heating. There are a couple of TVs and a DVD player. A washing machine, tumble dryer and dish washer are also provided to help with the chores. Outside Colts Close Cottage you have a patio with furniture and a summerhouse; and, of course, that swimming pool. Should you decide to leave the cottage, and explore the area, you'll find the nearest pub is ¼ mile away. With the shop being a little further at 1 mile. The pebble beach of Lulworth Cove is a couple of miles away; with Durdle Door being well worth a visit too. You'll find Poole a few miles for the east, and Weymouth a few miles to the west. A few National Trust properties are in the area: Clouds Hill ("The rural retreat of T. E. Lawrence"), Hardy's Birthplace ("Evocative cob and thatch cottage - birthplace of Thomas Hardy") and Corfe Castle ("Thousand-year-old royal castle shaped by warfare") to name but a few. Your holiday at Colts Close Cottage starts on a Friday; with short breaks also being available.